It is a real pleasure for me and my wife Pinghua to visit Eton College. Thank you for the warm welcome. I also want to thank Secretary of the Frontier Society Fred Kim for the kind introduction. You have come to Eton College to learn. I hope I may also encourage you that, in such a fast changing world, the habit of learning will be a life-time occupation. Certainly that is my experience! Recently I have learned two English words. One is Oxonian. 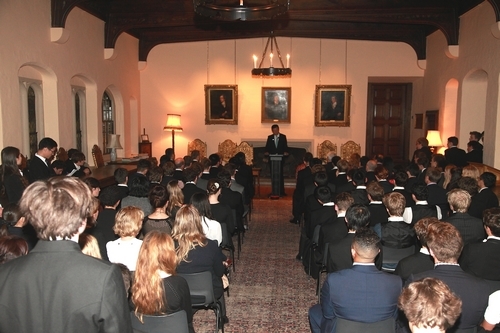 I just visited Oxford University last week and gave a speech at the Oxford Union. 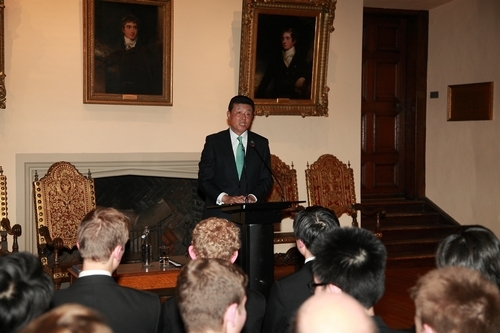 In my speech I mentioned several Oxonians who made huge contributions to China-UK relations. Today at Eton I have learned another word—Etonian. Many Old Etonians have made a profound impact on the world. The most recent is Sir John Gurton who shared this year’s Nobel Prize in medicine. I warmly congratulate him especially as he overcame the burden of former Eton Headmaster’s comment that he was “too stupid for biology”! · They both have a history of hundreds of years. · They are both located by river Thames. · They were both chosen to be the settings for the film Harry Potter. · And they have both produced a wealth of talents. I wonder whether you have a word ‘Oxtonian’ for those attending both Eton and Oxford! James Bond is in the news again with his latest movie called ‘Skyfall’. You may be interested to know his films are very popular in China! A less known story is James Bond also went to Eton and Oxford. I gather that the story goes that he was expelled by Eton for his talent in trouble making! Many of you are members of the Frontier Society. The word frontier reminds me of the United States where I was posted twice. In the US history ‘frontier’ was a term with special meaning. It referred to the ‘wild west’ that was developed by the US in the second half of the 19th century. In the 1960s President Kennedy made an initiative to explore the ‘New Frontier’, which meant space. I have been told that the word ‘frontier’ in the name of your society has taken on a new post-modernist meaning—emerging economies or powers that will assume major influences in the future. These include China. In today’s audience there are also members from the Oriental Society and Keynes Society. Obviously a common subject that interests all the three societies is China. So my topic today is China, a country that is ever old, ever young. China has a long history. Among the world’s four great ancient civilizations China is the only one that has continued to these days without any break. I was Chinese ambassador to Egypt. Egypt is also a very old civilization. Its recorded history started even earlier than that of China. But due to many years of foreign occupation and rule the Egyptian civilization died out. The writing system currently used in Egypt is entirely different from the hieroglyph in ancient Egypt. Luckily in early 19th century archeologists deciphered ancient Egyptian characters that had been lost for 1400 years. This was done with the help of the Rosetta Stone which is now kept in the British Museum. China also suffered foreign invasion and aggression. However unlike other civilisations Chinese culture and civilisation has had the strength and resilience to survive. As I will explain it has survived well. China was the biggest economy in the world for almost all of the past 2000 years. Data from The Economist also points to China having about a third of global GDP for most of that period. So it should not surprise that products from China were in high demand. For centuries China’s silk, porcelain and tea were the most sought-after products around the world. In those times ‘Made in China’ was synonymous with the most expensive luxury goods. Apart from its vast economy and wealth, China fostered a highly developed and sophisticated culture. Two major native Chinese philosophies were Confucianism and Taoism. They encouraged pursuit of success and stressed a sense of mission. At the same time they aimed at harmony between man and nature. The four major inventions by China—paper making, compass, gun powder and movable printing—contributed greatly to world civilization and human progress. The monumental impact on world civilization and progress of humanity by Chinese inventions was fully recognized by a British scholar in the past century. China fell behind in modern times. The industrialisation that started in Britain changed the world. The traditional agricultural civilisation of China struggled to find its place in the rapidly industrialised world. In addition, in the 20th century, China was caught between the millstones of foreign invaders and civil war. The poverty, suffering and humiliation that Chinese people suffered is indescribable. The author of this poem was an Old Etonian—Shelley. China finally ushered in the spring in the late 1970s when it embarked on reform and opening up. In the more than 30 years that followed, the Chinese economy has grown at an annual rate of 10%. No country in human history has industrialised so fast and on such a scale. In addition, more than 600 million people were lifted out of poverty. Today, China ranks number two in world economy and is the world’s second largest trading nation. Since the financial crisis hit the world five years ago China has become the powerhouse and ballast of global economic growth. Besides economic prosperity, China has made across the board progress in cultural, political and social fields. Last week Chinese writer Mo Yan was awarded Nobel Prize in Literature. This is the first time that a Chinese writer has had this honour. Now the whole world is watching China. China makes headlines in British newspapers and TV media. Walking into any Waterstone bookshop, you will find a full shelf on China. So, how to get a clear picture of today’s China when there is a flood of information and so many perspectives? I would like to offer you three observations. First, China is following a development path suitable to its national realities. So, how should a large country with 1.3 billion people achieve its development goals? · There is no precedent in history. · There is no ready answer in the textbook. · Copying others won’t work. · Wishful thinking in isolation of the world is a dead end. So, the Chinese people have based their efforts on China’s national conditions while drawing on useful experience of other countries. · It focuses on economic development. · It puts people first. · It promotes comprehensive, coordinated and sustainable development. · It upholds social equity and justice and protects people’s democratic rights. · and the system of multi-party cooperation and political consultation under the leadership of the Chinese Communist Party. The economic institutional guarantee for this development path is a multi-ownership economy. Public ownership is the mainstay of the economy. At the same time, it allows development of private ownership and foreign investment side by side. This development path has similarities with other countries. It also has characteristics only found in China. · China is a large economy in total size. · But per capita GDP of China was only 5432 US dollars last year. According to IMF statistics, this figure was only one seventh of that of Britain. · That ranks China at 89th place in the world. · In China 128 million people still live in poverty. That means 128 million Chinese live on one dollar per day. If measured against the UN criteria of poverty of living on 1.25 dollars per day, then the Chinese poor population will be even higher. Let me draw on my own experience to give a sense of this poverty. I once worked in one of China’s poorest western provinces—Gansu as Assistant Governor. I visited more than 60 of its 86 counties. Here I felt very strongly the wide gap between China’s west region and its eastern coastal areas. This is the divide between rural and urban areas. In some villages of Gansu even clean water was difficult to access. These people have a long way to go before they get out of poverty. · Today’s China pursues an independent foreign policy of peace. The goal of Chinese foreign policy is to maintain world peace and promote common development. · China embraces a new security concept that stresses mutual trust, mutual benefit, equality and cooperation. · China pro-actively fulfills its international responsibility. · It insists on good neighborliness and regional cooperation. · It calls on all other countries to work together for a harmonious world of lasting peace and common prosperity. · China will never seek expansion or hegemony. · The theory that “a strong country must seek hegemony” will never apply to China. China is committed to peaceful settlement of international disputes and crisis issues. As evidence of this, China has sent a total of more than 20 thousand people of various types to 30 UN peacekeeping missions. This makes China the permanent member of the UN Security Council that has sent abroad the largest number of peacekeeping personnel. China has resolved boundary issues with its 12 neighboring countries on land. China believes disputes over territory and maritime rights with neighboring countries should be resolved through peaceful negotiations. China will do its best to maintain peace and stability in South China Sea, East China Sea and its surrounding areas. Recently Japan has announced its so-called “nationalisation” of Chinese territory Diaoyu Dao. This move has grossly violated China’s sovereignty and territorial integrity. It has sparked firm opposition and strong protest from the Chinese people. We urge Japan to immediately stop all its actions that violate China’s sovereignty and territorial integrity and return to the track of resolving disputes through peaceful negotiations. 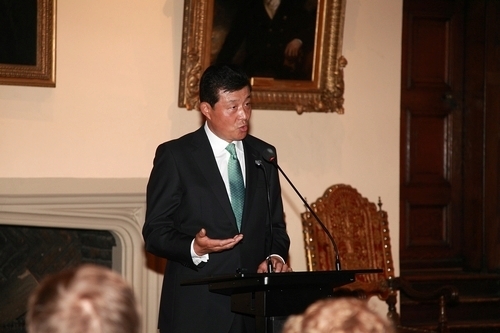 It is over two years since I arrived in the UK as Chinese Ambassador. Since my arrival, I have often read in Western media worries about China’s future - sometimes even prophecies about China’s doom. The reality is that we Chinese people are confident about our own country. This is backed up even by an American research company. The Pew Research Centre’s survey last July showed that 83% of Chinese people were optimistic about Chinese economy. While in the US and UK, the figures were only 31% and 15% respectively. As a Chinese diplomat I have every confidence in China’s future! So, what are the foundations of my confidence? First, the Chinese economy has great potential and a strong drive. Last year urbanisation rate in China for the first time passed 50%. Britain already reached this level in 1851. The average urbanisation rate in developed countries now stands at around 80%. Urbanisation in China will continue for several more decades. This will create immense demand in housing and infrastructure. As I said earlier, China’s development is not balanced between different regions. The regional balancing process will boost investment and domestic demand and provide a bigger marketplace. China’s consumption mix is upgrading from living necessities like food and clothing to houses, cars and education. China’s strength in its large labour force will continue for a long period. With more government input in education, China’s human capital will be strengthened. This will bring new population dividends. The second reason for my confidence is that China’s development will be more comprehensive and inclusive. · China will continue to advance democracy and rule of law. · China will uphold social equity and justice. · China will realise human freedom and the all-round development of Chinese people. · China will ensure and improve people’s welfare so that all Chinese people will benefit more from development. · China will build a resource-conserving and environment-friendly society. 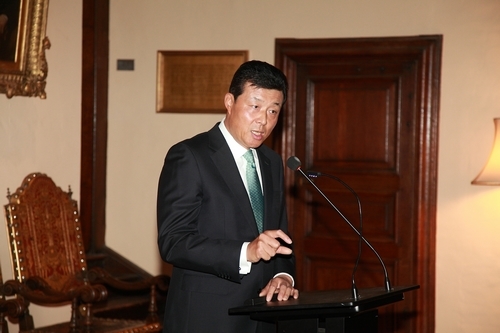 · China will focus on sustainable development. We will try to catch up with developed countries’ per capita GDP figures. But, most important, China must not overtake developed countries in energy intensity and green house gas emissions. · China needs a peaceful environment for its development. · It will also safeguard world peace and promote common development with its own development. · China will actively participate in international system and global affairs and play a constructive role in it. · China will adhere to its win-win opening-up strategy. · This will be done by expanding imports, increase outbound investment and creating more jobs. In turn, China’s actions will create wealth for all other countries and promote world economic growth. The development path that China has followed for more than three decades has profoundly changed China. We have every reason to believe that staying on this path will lead China to a brighter and better future. I have been to dozens of British universities and many middle and primary schools. Every time I visit a school I want to know about language teaching. In particular whether Chinese is being taught. The reason is that I always believe that understanding China starts from learning its language. Language is one of the essentials that form the culture and character of a country and a nation. Mastery of a foreign language gives you a key to open another world. So, learning Chinese will help you understand China, its rich culture and fast development. You will also make many friends amongst its hard-working and ingenious people. Mastery of Chinese will make you proud because you will be able to speak not only the most widely used language – English - but also the language used by the largest population—Chinese. I am glad to learn that Eton was one of the earliest British schools to open Chinese language course and include it into the A Level curriculum. I have also learned how this has motivated Eton to organise visits to China. These study tours in China and Chinese Summer School are bound to boost students’ interest in learning Chinese. I hope a Confucius Institute will open in your college in the not-too-distant future. This will open up another channel to learn Chinese and understand China. To help you learn Chinese language and understand China, I have brought you some books and discs on Chinese literature, art and folk customs. Some of them are in English. Some are bilingual. I hope you will find them interesting. China and Britain are both great countries. We both made great contribution to human civilization. In this new era, China and Britain should join hands to promote common development. Through our collaboration we can make even greater contribution to world peace and prosperity. 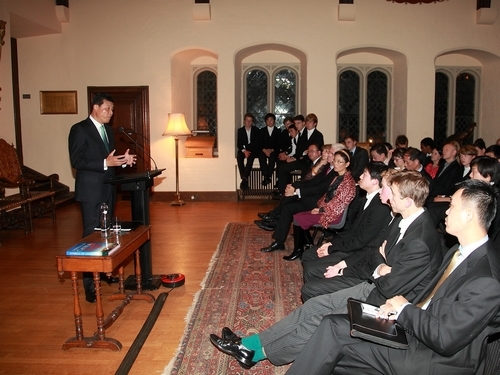 Maybe the future of China-UK relations to a large extent also lies here at Eton. The pattern of history suggests that you will be the major participants and builders of future China-UK relations. Today, I hope my speech would inspire you to reach out and work with the young generation of China. Together you can build a bright future of China-UK relations. That is the path to create a peaceful, sustainable and harmonious world.